I am you know - I'm, in the parlance of the school yard, dead jammy! (is that just a Yorkshire phrase?). Today I plunged my hand into the big bag of goodies from Marie for my Blog Swap and my hand found the parcel that all knitters want to find the most - the YARN!!!! I have just one thing to say - Oh My!! Aren't these glorious? If nothing else had come in my extraordinary box except these two skeins I would have been ecstatic! Saxon Merino wool is custom spun into a lace weight singles yarn at the Green Mountain Spinnery; the yarn is uniquely hand-dyed at the farm in small, limited-edition dye lots. 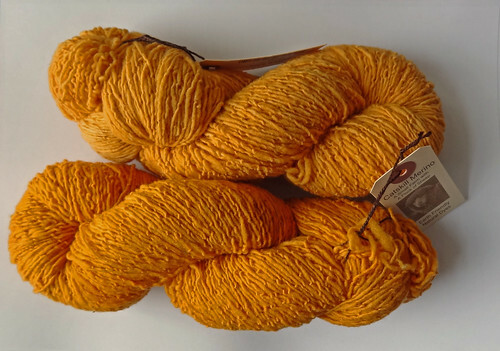 Each skein is 350 yards and weighs 2oz. For the Europeans this equates to 320m and 56.7g. This means I got more than the swap minimum of 100g LOL. We hear so much about American yarn in the UK. For one thing it is much easier to obtain, it is cheaper and great quality. If you want quality yarn in the UK you really have to pay for it! One of the reasons I was delighted to get a box from the US was the thought of getting hold of some mystical American Yarn! This is so much better than I dreamed of. I love that this is from such a small dye lot and, that as it is hand-dyed, it is unlikely to ever be exactly matched again. I know this is a very special yarn indeed. 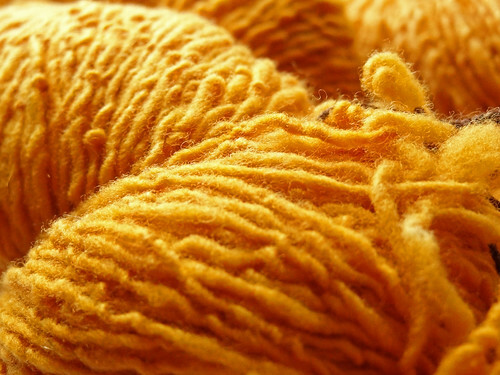 It really is a local New York State yarn as it is grown, spun and dyed there. 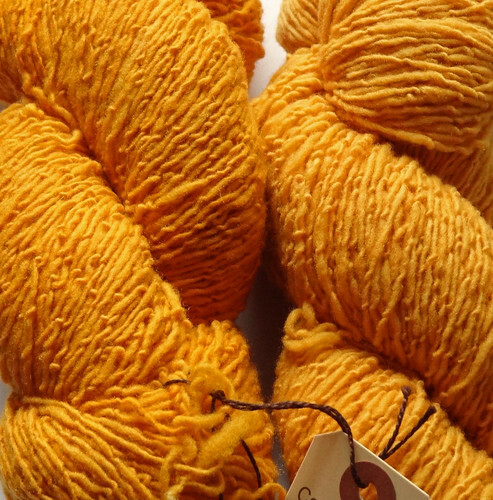 Marie stated in her accompanying note that she couldn't find the lace weight in my "major" colours (I'm thinking of the greens and purples here) so she decided to "encourage my continued exploration of mellow gold". Oh Marie, you have very much encouraged me in my love of this colour. It is truly glorious. It makes me think of the Summer. I adore it. I can't wait to start knitting with it, but I really want to make sure that this gets used for the perfect project. I know I'm going to spend weeks obsessing about the right project for this yarn. These babies are going to get knitted into something special and I am NOT going to let anyone tear the finished article from my fingers! Marie you are a champion swapper - thank you so much for knowing what I would love.